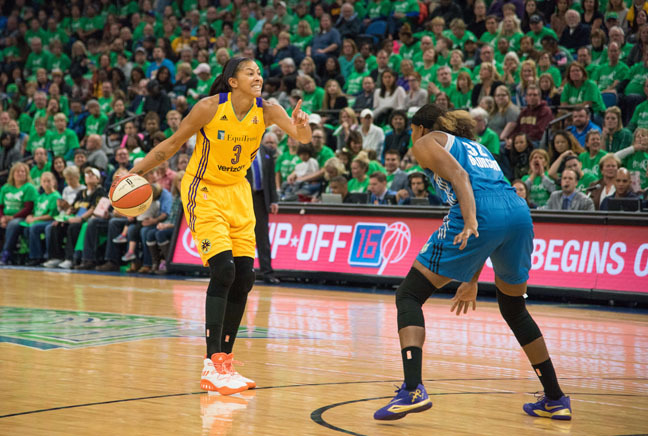 With five seconds left in the fourth quarter, the Los Angeles Sparks were down by one point. The ball landed in the hands of forward Nneka Oqwumike, a rebound from guard Chelsea Gray’s missed fade-away jumper. Ogwumike attempts to shoot, but Minnesota Lynx center Sylvia Fowles swatted the ball from the basket. With four seconds left, the WNBA MVP obtained possession again and attempted to shoot another short-range jumper. Throughout the season, the Sparks won games by large margins. However, a one-point lead edged out their most formidable opponent to seal their 2016 run in the history books. 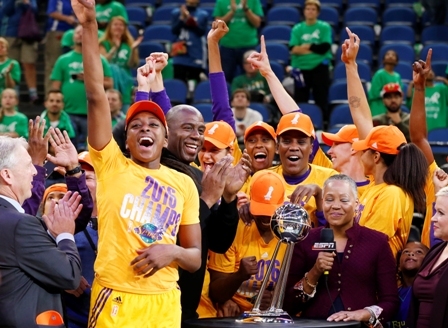 The Sparks dethroned the Minnesota Lynx 77-76 in game five of the WNBA Finals. Center Candace Parker scored 28 points and 12 rebounds, Ogwumike earned 12 points and 12 rebounds. For the Lynx, forward Maya Moore scored 23 points and 11 assists. Guard Seimone Augustus earned 17 points. Los Angeles earned their third championship in franchise history. Parker won Finals MVP honors, she donned orange shoes to pay homage to her years playing for the Tennesse Lady Vols under the tutelage of the late Pat Summitt. Game five was a ravenous battle made up of 24 lead changes, both teams tied 11 times. The Lnyx kept up with the Sparks tempo throughout the first quarter. Ogwumike went scoreless during this period and focused on rebounding and pressuring the Lynx into making turnovers. The Minnesota defense was lenient on guard Alana Beard, allowing her to attack the basket. Los Angeles was down by one going into the second quarter. Around the six-minute mark, Ogwumike was charged with her third foul. Forward Essence Carson and guard Kristi Toliver began collecting fouls. Minnesota made good of possessions, their frontcourt forced the Sparks to rely on their speed to get close-range shots. By Halftime, the Sparks had a six-point deficit. In the third quarter, Lynx head coach Cheryl Reeve earned a technical foul from stepping outside the coaching box. Fowles had dislocated her finger and Reeve was trying to get the attention of the Lynx that were on court. The call concluded with a free throw opportunity for the Sparks and they were within three points. Both teams kept trading shots and the score stayed close. Los Angeles continued to have foul troubles and Fowles returned to the game. The Sparks were down by one going into the last quarter. 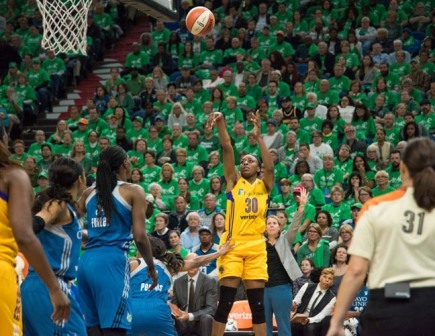 Guard Chelsea Gray carried Los Angeles, she scored 11 points straight from the final minutes of the third quarter to the fourth. Parker’s shots would edge the Sparks into a six-point lead. But, the Lynx caught up and tied at 71 points with 1:48 left in regulation. Ogwumike released a scoring jumper right at the end of the shot clock. WNBA Chief of Basketball Operations Renee Brown released a statement noting how the officials should have called a shot clock violation on Ogwumike. However, the match continued without a call. As minutes turned into seconds left in regulation, the score showed how either team could have won the championship.